Use a large bowel to cut a circle out of the brownie and put it to one side. 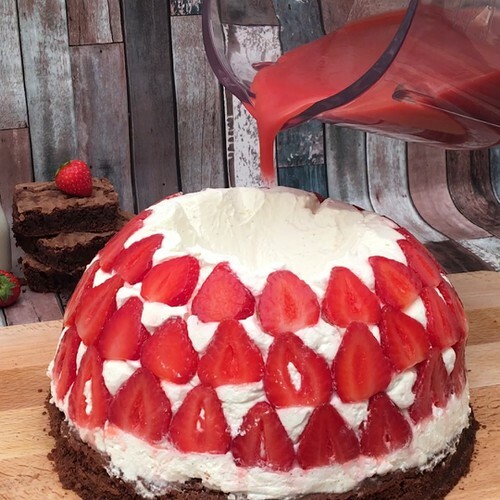 Line the same large bowl with clingfilm, then add slices of strawberry all around the sides. In another bowl, mix the mascarpone cheese with the sugar, vanilla seeds and cream, and whisk it all together until thick and creamy. Add the cream mix to the bowl lined with strawberries, and place the bowl in the freezer for 4 hours to set. Add the remaining strawberries and 50g of sugar to a blender and blend until smooth. Then unmold the cream bowl onto the top of the brownie circle, and remove the clingfilm. Dip a ladle into boiling water, then use it to melt a space into the top of the cream, then pour the strawberry mix into the space in the top of the cream. Serve slices and enjoy.